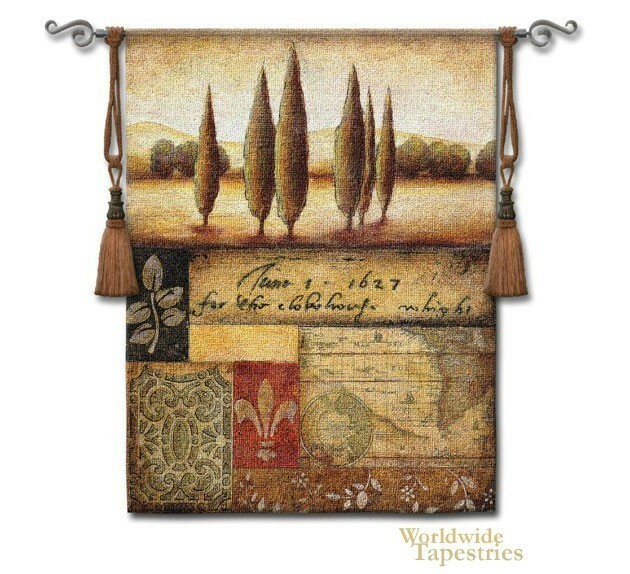 This modern landscape tapestry "Renaissance Landscape" is from the work of artist Susan Osborne. Here we see her influences from overseas studies in Scotland before returning to the US to settle in Arizona. In this piece we see poplar trees reminiscent of Tuscan landscapes, with elegant icons of fleur de lis and flowers and a map to represent Europe. The color palette is coherent with olive greens punctuated by reds and deep blues. This modern landscape tapestry "Renaissance Landscape" is backed with lining and tunnel for easy hanging. Note: tapestry rod and tassels, where pictured, are not included in the price. Dimensions: W 44" x H 53"